In the past, fiberglass pools had somewhat of a bad rap, but today’s savvy homeowners know that the advantages of owning a fiberglass swimming pool are many. From maintenance to cost to durability, you can’t go wrong with a fiberglass pool. They are easy to maintain, offer greater cost savings and are built to last … not to mention the beauty this pool will bring to your backyard. Let’s take a look at just why you should consider a fiberglass pool. Once only available in a white finish, the options for fiberglass pools are now endless, making them one of the most popular choices in pools. 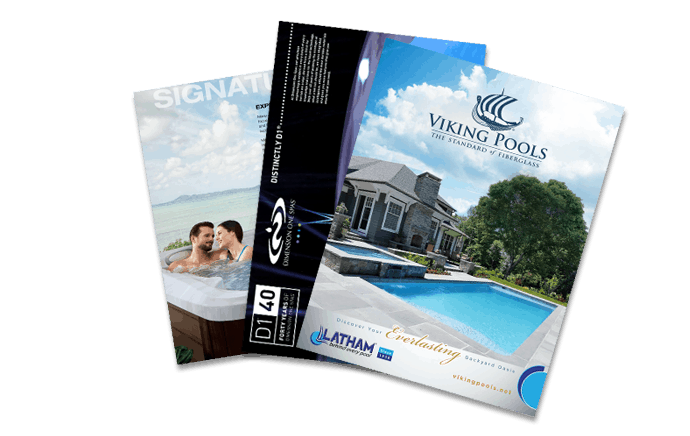 You can mix and match options to customize your pool for a unique design. Choose from tanning ledges, seats and built-in spas to make your pool one of a kind. Colorful finishes in Sapphire Blue and Pebble Beach bring the water to life and make it sparkle. Further customize your design with LED lighting and water features like spillovers, cascades and waterfalls. And don’t forget to adorn your fiberglass pool with the latest in beautiful pool tiles. With a fiberglass pool, you can create the backyard of your dreams. Maintenance can be a deterrent to those who are considering installing a pool. And with good reason. But with a fiberglass pool, maintaining your pool is a breeze. You’ll spend less time working on your pool and more time in your pool enjoying it. Afterall, that’s why you decided to have one installed in the first place. Because fiberglass pools are inert, they do not react with the water. So there is no need to test and balance the water on a daily basis. And its nonporous shell means that algae can’t cling to the surface. Gone are the days of constantly scrubbing down the sides of your pool. In-floor cleaning systems can also be installed to make your pool practically maintenance-free. Fiberglass swimming pool owners agree, the time saved maintaining their pools makes choosing a fiberglass pool a no-brainer.